Collections are from Strasbourg TGV station. Departures are from Mulhouse TGV station; by arrangement we can drop at Basle-Mulhouse-Freiburg airport. 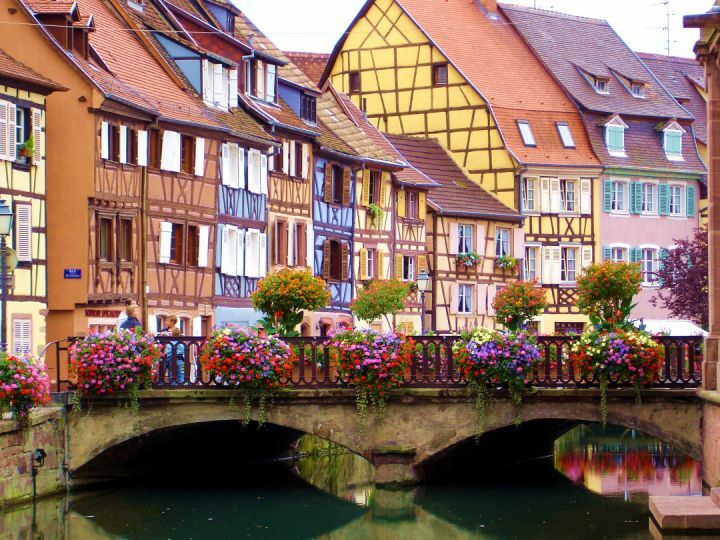 Sitting along the Eastern edge of France, on the left bank of the river Rhine, Alsace has a character and ambience quite different from the rest of the country. From the gothic script on street signs and hotel and restaurant names, to the half-timbered medieval houses, there is a Germanic flavour mixed in with many old French traditions — a unique cocktail. The tastes of the region are as distinct as the architecture. Strasbourg is famous for its sausages and also for choucroute, the alsatian take on Sauerkraut, made with cabbage cooked in local wine loaded with chops, sausages and other meaty delights. Coq-au vin is made here with local Riesling wine. 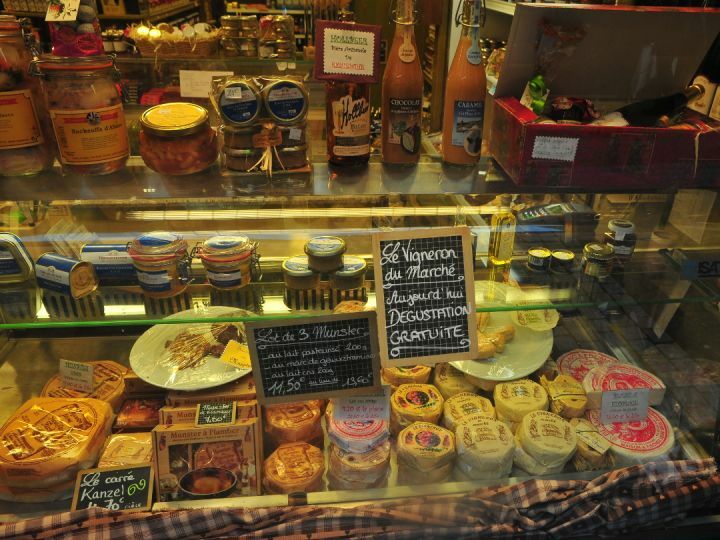 Pride of place in Alsace goes to foie gras, here served in a pastry crust, and some notable cheeses like Munster made with milk from the Vosges pastures. 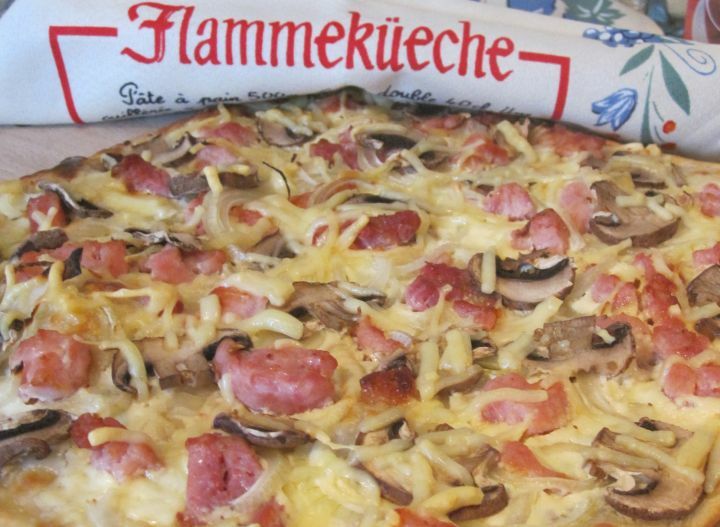 For a quick snack, try flammeküeche the Alsace pizza. For liquid refreshment, there is no shortage of choice. The distinctive slender bottles of the region contain wines of some equally distinctive cepages or grape varieties. Gewurztraminer with its golden colour and heady aroma of lychees and passion fruit; complex Pinot Gris with smoky undertones and apricot fruit; delicate Riesling with citrus notes and floral hints; and Sylvaner with notes of fresh cut grass and elderflower. Less well known are the light and cherry tinged pinot noir reds, and the sparkling Cremant d’Alsace. 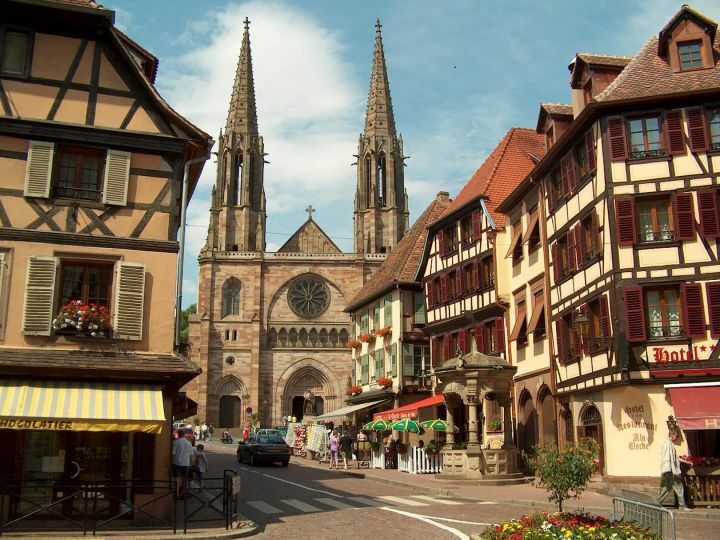 Beer lovers are also catered for — Strasbourg is home to Kronenbourg and Fischer, and a host of artisan breweries are found throughout the region. The geography of Alsace is effectively in two halves; the Alsace plain is a strip of land running alongside the Rhine from Strasbourg to the swiss border; flat, with fields of vines, wheat and sunflowers, intersperced with orchards growing apples, pears and quince. Rising like a natural border to the west are the Vosges mountains, the round topped peaks here known as ballons. Heavily wooded with chestnut and oak, then pines and mountain ash at higher altitude. The forests provide welcome shade in high summer. Our tour takes in the best of the sights, sounds and tastes that this fascinating region has to offer. 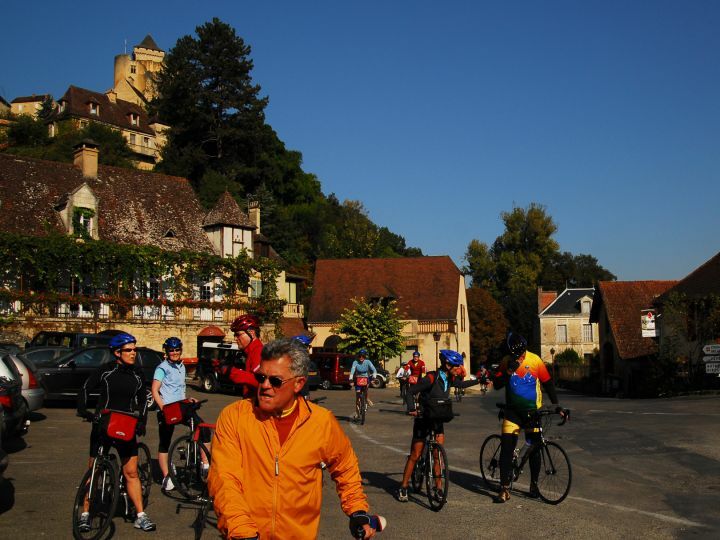 Riding is mixed, with days of flat riding moderately hilly days interspersed with with days of flat riding and will be enjoyed by anyone with a little cycling experience. Pickups are from Strasbourg TGV station, Strasbourg airport or Baden-Baden airport. 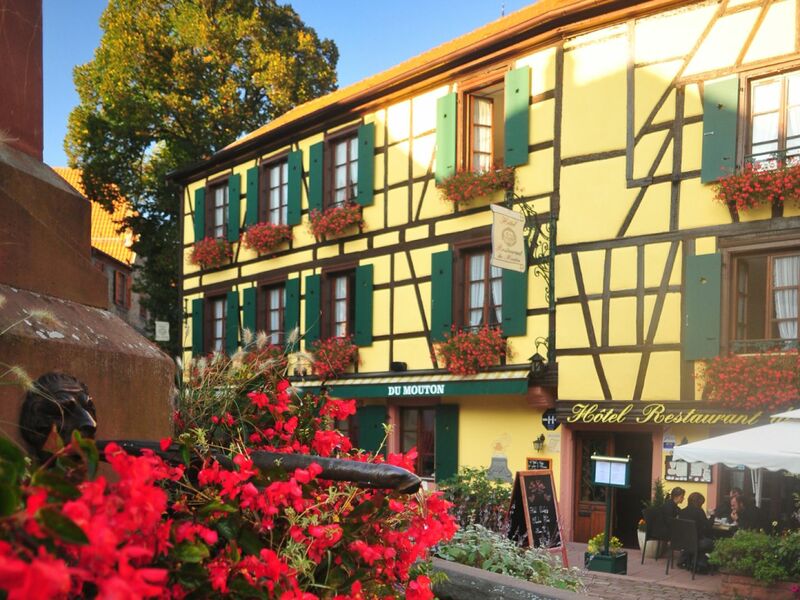 A short transfer takes us to the charming village of Ottrott, nestled at the foot of the Vosges mountains. 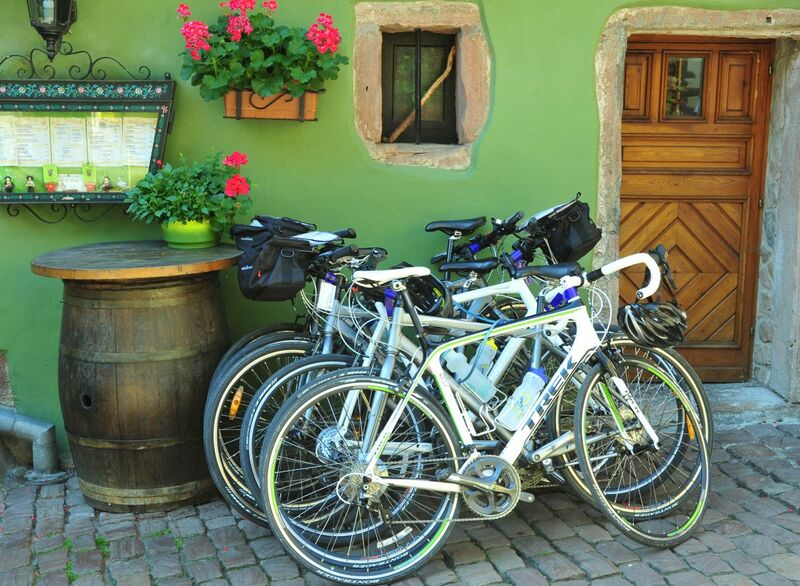 At our hotel in the heart of the village we will set the bikes up making sure that everyone is perfectly fitted. An excursion takes us into the market town of Obernai with its picturesque market square and the 16th century grain market. Those wanting a harder workout can tackle a climb to the convent of Mont Sainte-Odile — those wanting to conserve their energy can ride up in the minibus and rejoin their bikes at the top! The convent is a site of pilgrimage to the saint who legend has it was born blind, but miraculously was able to see after being baptised. Work on the convent was started in the 12th C, but the visit is as notable for the stunning panoramas as for the convent itself. Back at the hotel, relax by the pool before a fabulous dinner with local specialities and a bottle or two of the red wine that bears the village name. 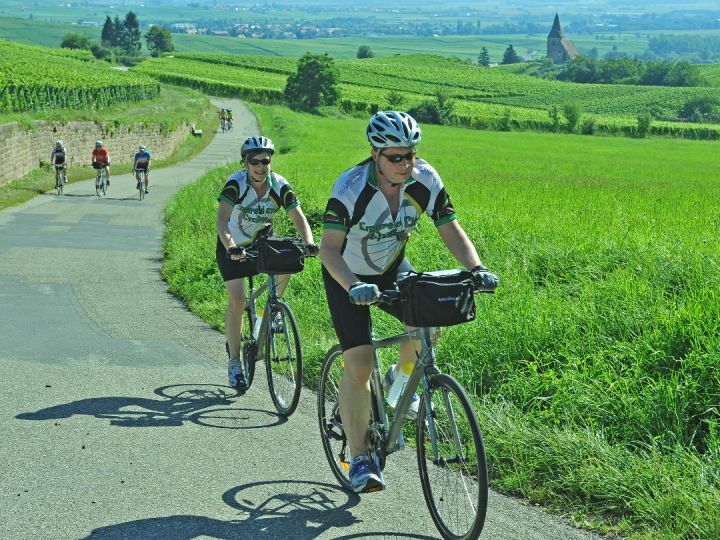 We start the day off riding through vineyards and one of the most picturesque villages of the region, Heiligenstein, before climbing into the lower wooded slopes of the Vosges mountains. An excursion on foot takes in the atmospheric ruined Spesburg castle hidden in the forest. Dropping through the woods we come to the pretty town of Andlau for coffee. The route then follows the Route du Vin as it winds in and out of the forests of the Vosges foothills. There is a climb out of the Lieprevette valley to the Château du Haut-Koenigsburg (a big climb, there is an optional minibus transfer to the top!) From the gardens of the Chateau the stunning panorama takes in the Black Forest across the Rhine to the east and all around, ruined fortresses on the summits of the Vosges mountains. A glorious descent brings us down to the plain before a short ride to our hotel for this evening in the charming village of Ribeauvillé nestling amongst the vines. The village is a fabulous place for a stroll before dinner, with timber framed houses, cobbled squares and 13th century church. More stunning landscapes today, but a shorter distance to recover (a little!) from yesterday’s excursions. The first section is a short but steep climb (don’t be ashamed to walk!) followed by a descent into to perhaps the most picturesque of them all, Riquewihr. Looking just as it did in the 16th Century, set amongst vineyards, it is the home of the Dopff winemaking family — noted for sparkling Cremant. 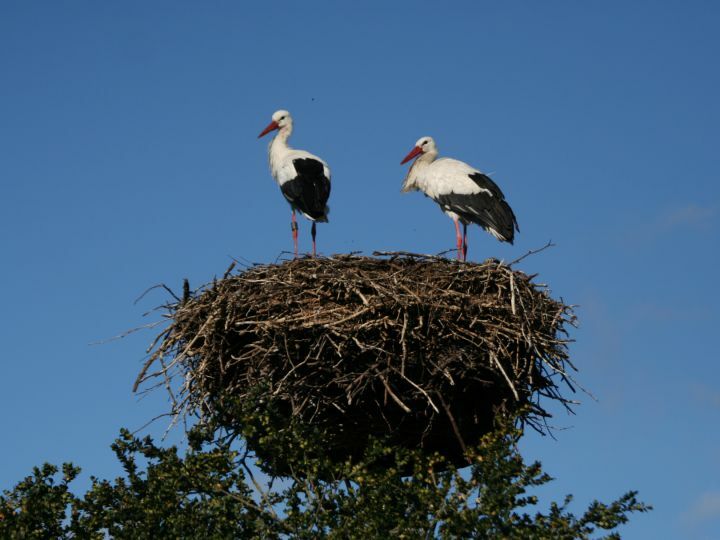 Keep an eye out too for the stork-wheels — cartwheels mounted horizontally on the roofs of houses to encourage storks to build nests (and thereby to bring good luck and fertility to the village) After rolling through the wine villages of Kientzheim and Ammerschwirr there is another climb to the spa town of Trois Epis. The effort is rewarded by sublime views and a regal picnic lunch. A second reward is 13km of stunning downhill riding to the village of Turkheim – home to one of the best reputed wine co-operative in France. Naturally we will be sampling a wide selection of the output – which includes all of the varietals of the region. After our tasting, there is a short and easy ride (thank heavens!) to our stopping place for the next two nights, the wonderfully Alsatian town of Colmar. Not to be missed in Colmar are the Unterlinden museum with some wonderful Rhinish art and the magnificent Retable d’Issenheim — a 24 panel alterpiece painted by Matthias Grünewald at the beginning of the 16th Century. Our hotel has one of the finest restaurants in the town, serving Alsacian specialities with a refined elegance. 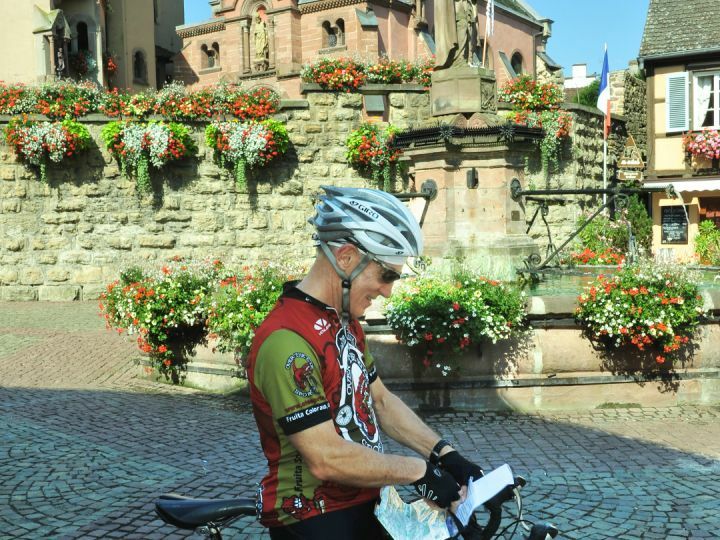 No packing today as we are staying in Colmar; today there are options for a longer or shorter ride , The ride takes us through the vines to a series of beautiful picturesque villages; stop for coffee in gorgeous Eguisheim, then climb past the ruined towers of the three castles above Husseren-Trois-Châteaux. 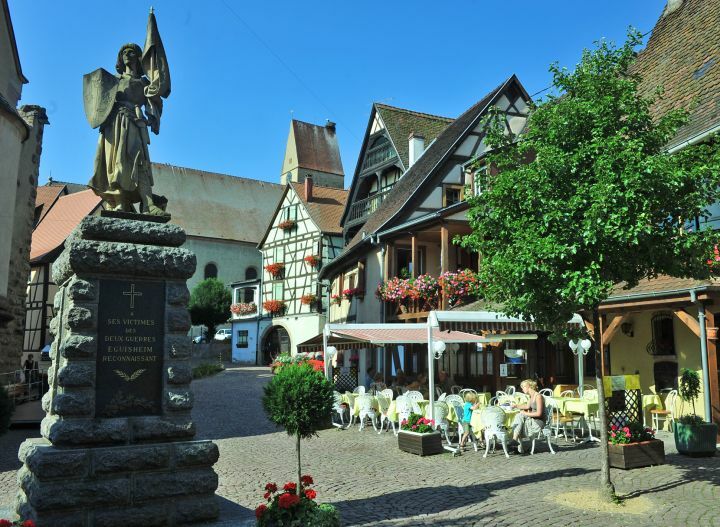 Those who want a shorter day can head for home to spend more time in Colmar; otherwise we continue through cobbled Gueberschwirr into the vines then descend to the market town of Rouffach for lunch. 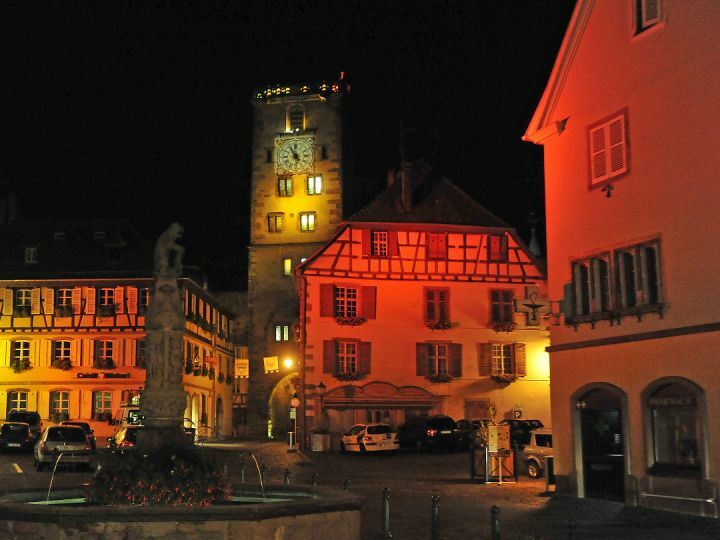 Rouffach has a marvellous 11th Century church and a 13th Century tower, known as the Tour des Sorcières (Witches’ Tower) which was used as a prison. The afternoon ride is flat across the plains of the River Rhine before returning to Colmar through the hunting forests that lie to the east of town. We eat out at the renowned Maison des Têtes restaurant. A flatter day today as we cross the Rhineland plain to arrive at the river. On the way we visit Neuf Brisach. This 17th Century fortification was built by Louis XIV’s military architect Vauban, and the 8-pointed star structure is still intact. From Neuf Brisach a series of dedicated cycleways brings us to the river. After crossing the river to enter Germany, we follow a riverside track, stopping for a picnic and to dip our toes if it’s a hot day! A half hour in the hotel sauna and a dip in the pool or would be a great way to get rid of the dust of the road before dinner in the hotel’s stylish restaurant. 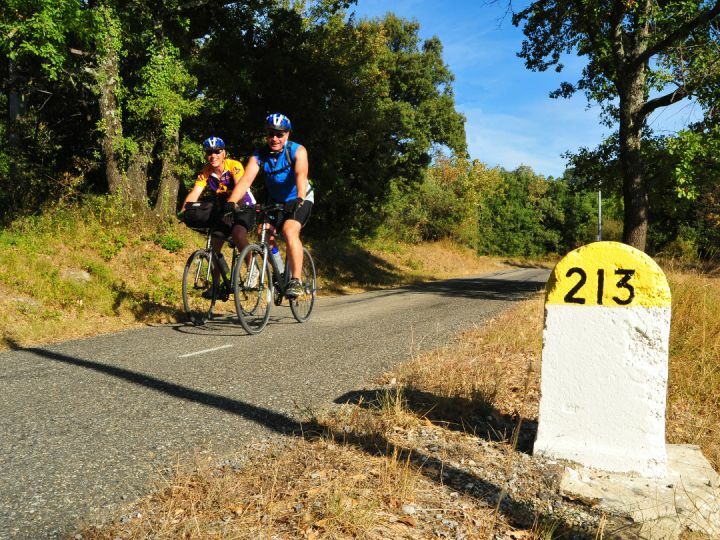 Our last day in the saddle brings a challenge for those who are up for it – a climb up to 1,343 metres to the Grand Ballon. Don’t worry if the climb doesn’t appeal – the minibus can take the sting out of it! No such worries at the start of the day as the route takes flat cycle tracks through the villages of Feldkirch and Böllwiller, before arriving at the village of Hartmanswiller with it’s fortified cemetery dating from the 15th C; the church and it’s graveyard were fortified as a place of refuge for the the villagers from bands of brigands following the Wars of Religion. The intrepid can then embark on the climb to the summit of the Grand Ballon – ride as much or as little as you like, then get into the minibus when you’ve had enough of emulating the heroes of the Tour de France. A fantastic picnic will be awaiting you at the top, no matter how you have chosen to get there! After lunch is literally all downhill as we speed through sublime landscapes down to the village of Thann. Thann is renowned for its richly decorated collegiate church with coloured roof tiles and intricate fretwork gothic spire. After a coffee and maybe a cake, the route returns to flat cycle tracks to our final destination, the impressive city of Mulhouse. Boasting a pedestrianised medieval quarter, a fine arts museum, and a superb automobile museum in the Schlumpf Collection, it is worth an extra night at the end of your tour if you are not in a hurry to get home! Dinner will be a last feast of Alsace specialities to send you on your way! Time to exchange e-mail addresses with your new cycling friends before transferring to Mulhouse TGV or Basel-Freiburg-Mulhouse airport for onward journeys. A traditional Alsatian auberge in the heart of the village dating from the 18th Century, its Weinstub restaurant is one of the most popular in the region for its Alsatian dishes with a modern twist. The 3* Ami Fritz has very comfortable rooms all furnished in individual styles. Situated in the pedestrianised centre of this beautiful village, the preserved exterior of the 3* belies the rooms which are large, comfortable and equipped with all modern conveniences. All around the hotel on the cobbled streets are cafés, restaurants and shops; a short walk as the sun sets takes us to a superb dinner in the village. Built in 1565 on the towns fortified walls, the 4* Maréchal is a jewel of charm and elegance. Outside the doors you step straight onto the cobbles and canals of the old quarter; at the hotel the fabulous L’Echevin restaurant has terraces overlooking the waters that give Colmar the nickname ‘Venice of the North’. Boasting a sauna, hammam and indoor pool, the 3* Domaine du Moulin is the perfect spot to recover from a day on the road. Take a glass on the terrace with swans and ducks on the lake in front of the hotel, before a memorable dinner in the hotel’s restaurant. The grand 4* Hotel du Parc in the centre of Mulhouse brings back the era of the roaring twenties with it’s huge rooms and art deco furnishings. A cocktail in the piano bar is a perfect way to toast the end of the tour before dinner in a superb Alsacien restaurant in the old quarter.